Home › Fish tank bowl › Fish tank aquariums. Fish aquarium or fish tank is an container with at least one transparent side to hold and display water-dwelling, plants and animals, including fish. There are thousands of fish pets for an aquarist to select from. There is also a huge choice in container sizes, shapes and types for the aquarist. The sizes of aquatic pet containers start from small one liter bowls and tanks onwards. Custom made public aquaria can hold thousands of gallons of water. Though, earlier the containers being made of glass had restriction in shape, with the availability of acrylic there is multiple choice in the shape of the aquarium. The limiting factors are availability of space at home or business premises and funds for purchase and maintenance of pets, fish aquarium, stands and accessories. The hobbyist must have spare time for the pets and at least some rudimentary knowledge in pet aquaculture. Glass panes and metal frames were used in earlier aquaria. The containers were made watertight by coating the joints with pitch. Later tar was introduced as the sealant. In such containers, the metal frame took much of the stress and there were frequent leaks. With the advent of silicone the joints between the glass pane became firm and all glass containers could be made. In some aquariums the metal frame is retained for purely ornamental and aesthetic reasons. Acrylic or Poly(methyl methacrylate) (PMMA) is a lightweight or shatter-resistant alternative to silica glass. Acrylic also has greater impact strength than the glass. It can be cut and joined into various shapes by solvent cements. 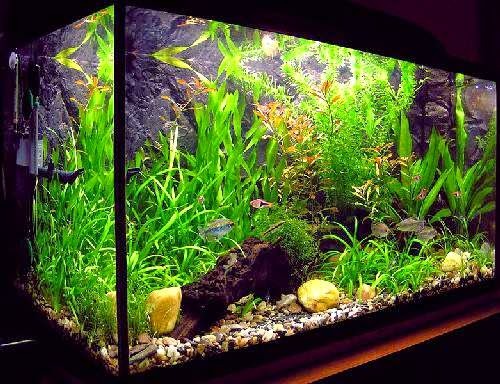 It is ideal for aquaria. Since acrylic is softer and more easily scratched than glass, scratch-resistant coatings are often added to acrylic sheets to protect them from scratches. Fish tanks as small as one liter capacity are available in market. Further round, hexagonal and "L" shaped aquaria can be obtained. On the higher side the weight of water has to be taken into account for constructing huge tanks. One liter of water weighs one kilograms. The Georgia Aquarium, for example, features an individual container of 6,300,000 US gallons.